First recluse of North America! Jeanne Le Ber was born in Ville-Marie (Montreal), on January 4, 1662. Daughter of Jacques Le Ber, a wealthy merchant of Montreal, and of Jeanne LeMoyne, Jeanne LeBer was also the goddaughter of Paul de Chomedey de Maisonneuve, founder and governor of Montreal, and of Jeanne Mance, foundress and administrator of the Hôtel-Dieu Hospital. 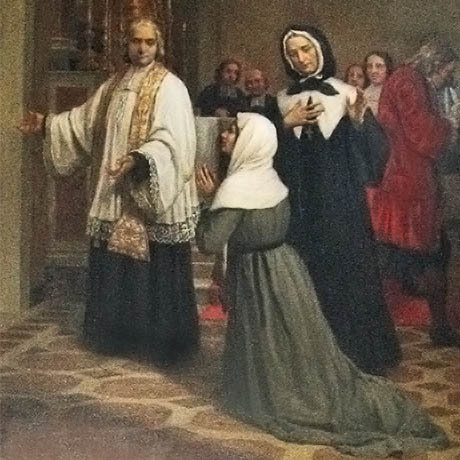 From her earliest years, Jeanne was attracted to Jesus in the Blessed Sacrement, an attraction which grew ever more powerful and was accompagnied by a deep desire for silence and prayer. When she was eighteen, she obtained from her parents' permission to live as a recluse in her family home. Completely withdrawn from the world, she left her home only to go to Mass. On August 5, 1695, at the age of 33, she made her reclusion more complete. She left her family and withdrew into the house of the Sisters of the Congrégation Notre-Dame where Marguerite Bourgeoys and her Sisters welcomed her with great joy. There she lived in a tiny room behind the altar of the chapel. Benefactor of Ville Marie, Jeanne gave away her fortune over the years, assisting the poor, the churches and the Congregation of Notre Dame. She made clothing for the most needy and provided for the schooling of disadvantaged young women. Her life now was one of the continual hommage to Jesus in the Blessed Sacrement, in union with the Virgin Mary and the Angels. Between her hours of adoration and rest, without cessing her prayer, she sewed and embroidered church vestments and worked for the poor. Her contemplative life has been an inspiration to the Recluse Sisters a religious congregation founded by two former students of the CND. Far from being indifferent to the outside world, she brought the concerns and suffering of her contemporaries to her fervent prayers. She prayed especially for peace in a war-torn country. She died on October 3, 1714 at the age of 52 years and 8 month "in great odour of sanctity." The entire population of Montreal attended her funeral there to offer their last respects. The mortal remains of Jeanne Le Ber are preserved in Old Montreal, in Notre-Dame-de-Bon-Secours Chapel, their position marked by a plaque on the wall. For more information, please consult our partners’ reference sites located in our Partners section.